We’re Going on a Bear Hunt Live on Stage is in the West End this summer, celebrating 10 years since its first UK tour. The show is at the Lyric Theatre, from 7th July to 2nd September 2018. Based on Michael Rosen and Helen Oxenbury’s much-loved book. Joey Hickman, who plays Boy, chatted with LondonTheatre1 about his career and the show. Joey: The Comedy About A Bank Robbery (Mischief Theatre), A Midsummer Nights Dream (The Watermill) and The Threepenny Opera (Graeae) are stand out productions for me. I musically directed and arranged the first two and had such an amazing experience shaping the music during the rehearsal process. It really was a pleasure and so exciting to see how the music developed alongside the show as a whole. Really thrilling. I was Show Musical Director in The Threepenny Opera which meant I took over from the Musical Supervisor once rehearsals had finished. Threepenny Opera was an epic show and Graeae’s signature style of making theatre accessible for every single show no matter what an audience member’s disability was a real eye-opener for me. It really did change my life and opened my eyes to the importance of accessibility in theatre. It is so utterly important and also immensely theatrical and incredible to watch when done well. There have been many wonderful productions I have had the pleasure of being a part of but the one show that always stands out for me is I Was A Rat. This was an adaptation of the Phillip Pullman book and it was directed by Teresa Ludovico. She is an Italian director and she brought a wonderfully anarchic and commedia dell’arte aesthetic to the show. She nurtured us in her style of theatre and direction and created a very special production. I loved it. We opened at Birmingham Rep as part of its centenary season and then toured for about 5 months. Best roles for me in that show were Billy, the leader of a street urchin gang, and also a deranged accordion playing circus monkey. Good times..! Q: How excited are you about being in We’re Going on a Bear Hunt Live on Stage? Joey: Really excited! What a joyful and silly show. It is so much fun to perform and I can’t wait to get in front of an audience and see the reactions we get from children and parents alike. I think the whole production oozes positivity and happiness and that’s what we need lots of at the moment. Q: What is at the heart of the production? Joey: At the heart is a loving family out for an adventure, telling their exciting story. And they want you all to be a part of it..! Q: Can you tell us about your character Boy? Joey: Boy is a mischievous and cheeky so and so. He loves to play and loves his dad, sister and little baby sibling. He and his sister have a good amount of competition between each other but they always look out for one another. Boy would definitely beat his sister in a race though…! Q: Why should everyone get along to see We’re Going on a Bear Hunt Live on Stage? Joey: Why wouldn’t you want to be taken on a fun, exciting, joyful and silly adventure?! Sounds good to me and no doubt parents and kids alike will have a whale of a time. There is laughter to be had by all and music to warm the coldest of hearts. It is a lovely show. Joey Hickman plays Boy. His acting credits for theatre include A Midsummer Night’s Dream, Oliver! (Watermill Theatre), Reasons To Be Cheerful, The Threepenny Opera (UK tour), Cinderella: A Fairytale, Romeo & Juliet, The School for Scandal (Tobacco Factory), Made in Dagenham (The Queen’s Theatre/New Wolsey Theatre), Thisbe (Door Ajar Theatre), The BFG (Birmingham Rep), I Was A Rat! (Birmingham Rep/UK tour), Dreamboats and Petticoats (Playhouse Theatre). As a Musical Director, Composer and Arranger his credits include The Comedy About A Bank Robbery (Criterion Theatre), Three Minute Heroes (Belgrade Theatre) and Our House (New Wolsey Theatre/UK tour). 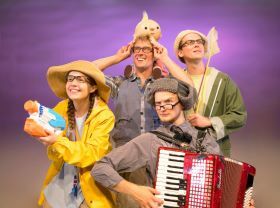 Join our intrepid family of adventurers and their musical dog on a quest to find a bear; as they wade through the gigantic swishy swashy grass, the splishy splashy river and the thick oozy, squelchy mud! Expect catchy songs, interactive scenes and plenty of hands-on adventure! Adapted for the stage from the modern classic written by Michael Rosen and illustrated by Helen Oxenbury.